« Dakota 38 Ride: Horse Power! Nice (winter) weather friday, so hopped in the Golf TDI for a 200 mile or so Christmas shopping trip. Noted a few unexpected noises from the head end pulling out of the garage, so pulled back in and put up the noisy corner on the jack for a quick inspection… Found nothing wrong. Put the car back down, turn the wheels lock to lock to see if the noise reappeared, pulled back out, noting heavy steering and a red battery icon ablaze on the instrument panel. Back into the garage, hopefully an accessory drive belt as I have a spare. No, ’twas the pulley on the alternator ’twas busted. Now if you been following this attempt at literature or at least literacy for a while, you’ve probably noted that I’ve been trying to time the market on a new VW TDI for the last couple months, waiting for just the tight moment when the VW TDI market is low and the stock market is high to pounce. And as also noted in these journals, the Ranger pickup in the background is pretty much a lost cause so I let the insurance and tabs on it run out, figuring I’d have a 2nd VW diesel here any day. Now out here in the country it’s a good idea to keep at least a couple running vehicles around, and this time of year that means vehicles with 4 wheels and heat… Got 3 running bikes in the garage, but in the last 3 weeks the temps barely made it above freezing for a couple hours, and the next weeks forecast will be great for further ice making on the area lakes. Of course, I spent the business hours of friday tearing into the VW, forgetting that my local insurance agent would close up for the weekend ’round sundown. By then I’d figured out what all needed replacing and found the best deal to be a new alternator that didn’t cost much more than the pulley at NAPA. Come saturday morn I call NAPA and because the alternator has to come from Kansas City, they don’t want to order it and instead offer a rebuilt for almost as much that can be here… tuesday. Well, looks like I’ll be getting the rebuilt that O’Rielly has in stock instead, but gotta get the Ranger legal to make the 40 mile trip to the parts store. Try Geico online but the rates near double State Farm’s… Why can’t State Farm get their act together and sell insurance online and let there agents sort out who gets the commission? No luck on tabs either, nearest site that’s open saturday is 30 miles away. So finished squeezing the Golf alternator out of it’s cave and put the charger on the Ranger. Law enforcement in my town is pretty scarce, usually don’t seem ’em unless there’s some livestock loose or a newbie officer got lost. So I took the Ranger for a short test drive, got up to 40 on the county road, and seemed OK. Spent today checkin’ out the Ranger and restocking with tools and such, including a failed effort to replace a very tired looking accessory drive belt… Turned out my spare was for a non-AC Ranger, as I deduced after a couple hours trying to make it fit. Just love getting the wrong parts when your trying to install a belt with a broken wrist! So plan is to bother the insurance agent in the morning, then run 5 miles over to the City Clerk’s Office to get tabs. then fill up the tank, drive to Marshall and get the alternator and finish xmas shopping… All this on a rusty Ranger riding on 12 year old tires, wish me luck. Then hopefully get the Golf back together for the 350 mile run to the cities on xmas day. I know, I’m cheap… It’s a family disease that come naturally when your parents and grandparents live like it’s still the great depression. Heck, my mom lived in that little trailer in Florida and shut off the pilot lights at night to save every last cent! We’re settling my mom’s estate on xmas day, and I swear that estate is the proceeds from selling the great grandparents farm in the 1950s and never spending the money. Yup, my grandpa who taught me us how to fix stuff and finally splurged on a new Rambler when he retired could have bought a new Caddy every couple years if he wanted to. 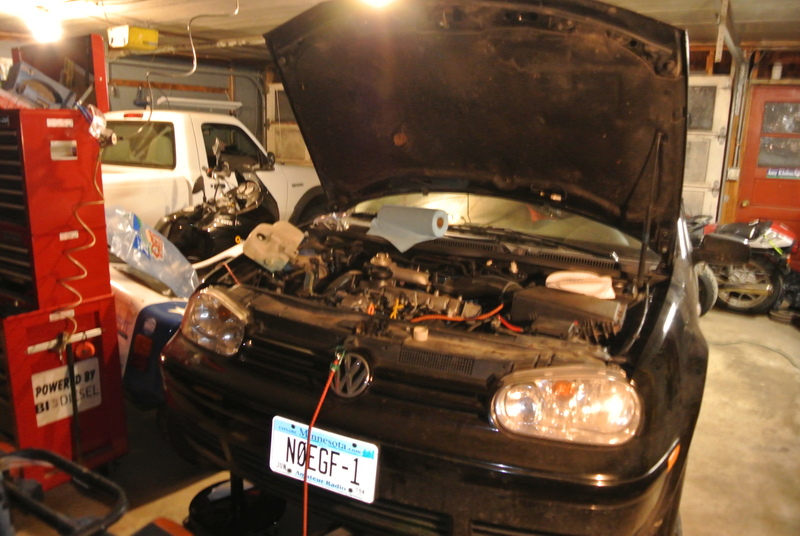 I’m working on my recovery, and painful as it is, I’ll probably buy a new VW TDI next week… Maybe.